KNITTING NEVER LOOKED SO COOL. 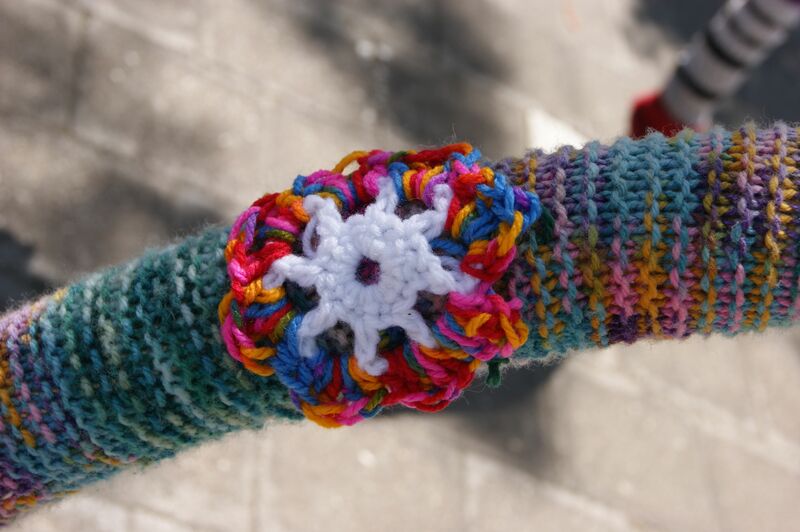 THE FAMOUS YARN BOMBED BIKE RACKS IN LIPSON ST PORT ADELAIDE HAVE RECENTLY BLOOMED WITH CROCHET SPRING FLOWERS. 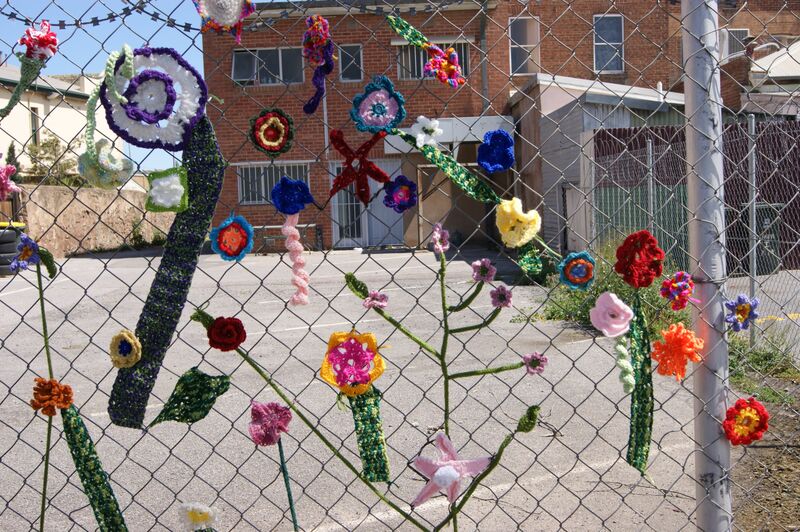 THESE CROCHET FLOWERS JUST KEEP POPPING UP IN THE STREETS OF PORT ADELAIDE. 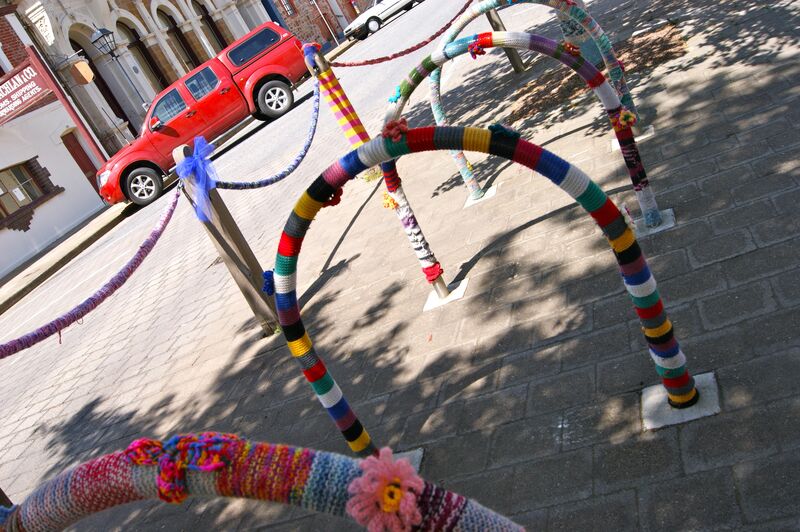 NO POLE, BIKE RACK OR FENCE IS SAFE FROM THE KNIT & CROCHET BOMBING CRAZE SINCE SPRING SPRUNG IN ADELAIDE. 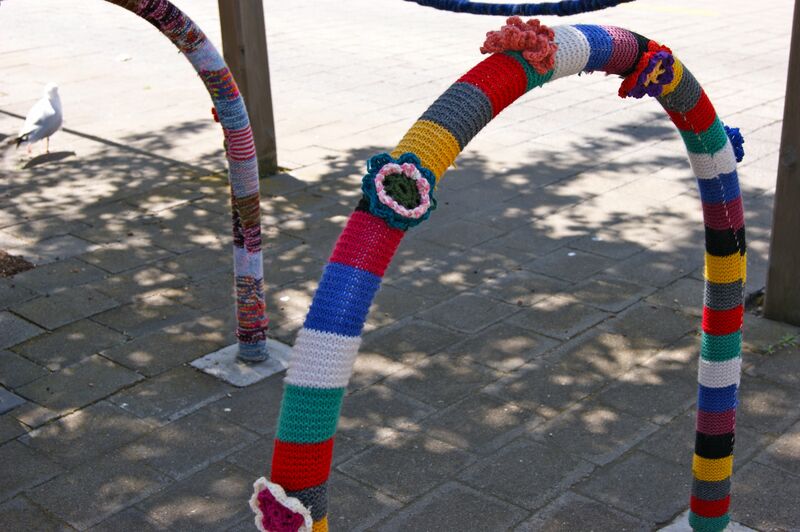 YARN STREET ART IS FABULOUS IN ANY WEATHER. 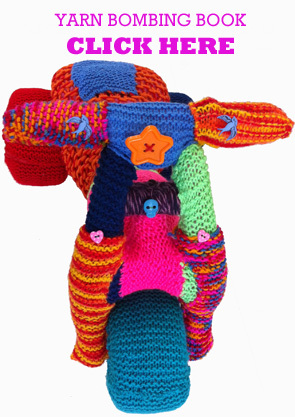 This entry was posted in Uncategorized and tagged craft, crochet, knitting, photography, port adelaide, street art, yarn bombing on October 24, 2012 by yarnbomb. 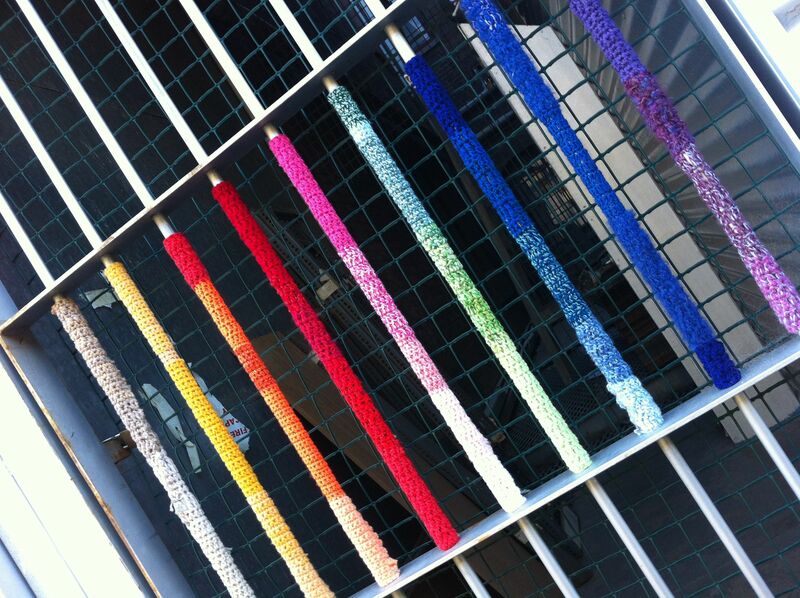 CROCHET & STEEL BARS GO WELL TOGETHER. THE BARS LOOK LIKE THE STEMS OF THE FLOWERS. 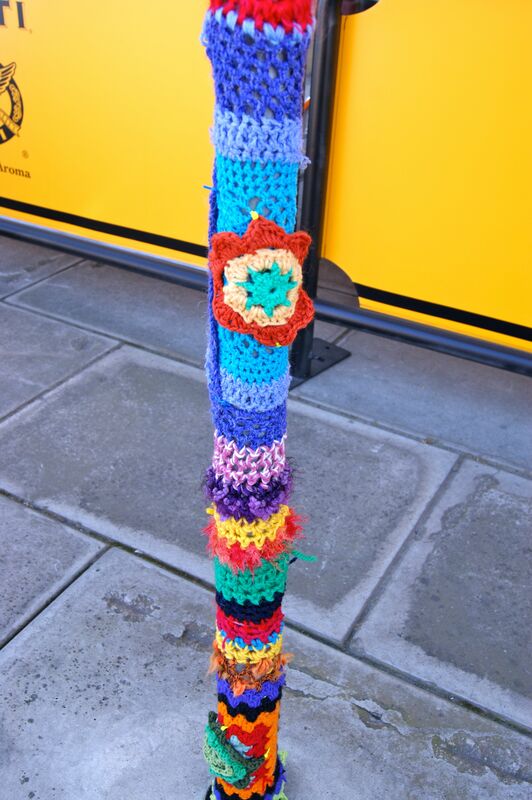 YARN BOMBING IS A FRIENDLY STREET ART & EVEN PEOPLES NANNAS ARE GETTING INVOLVED. 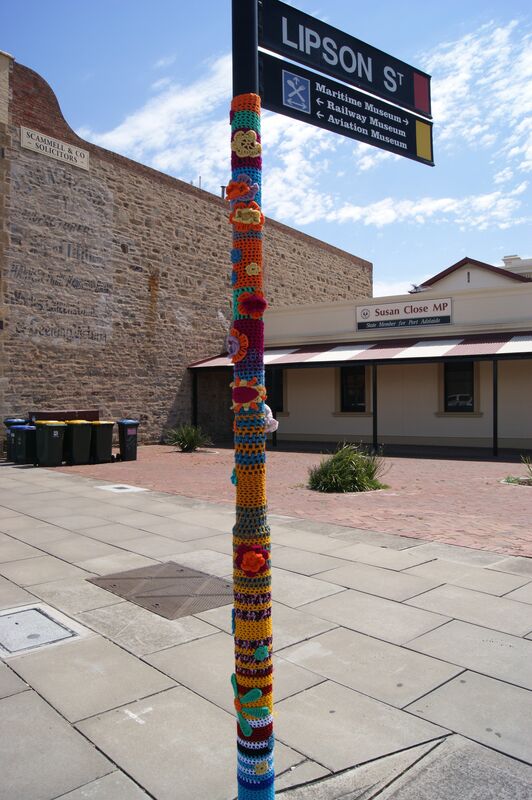 THESE YARN BOMBS ARE FROM A SIDE STREET IN PORT ADELAIDE & THEY ARE NEAR THE ENTRANCE TO ACTIVE ART STUDIOS. 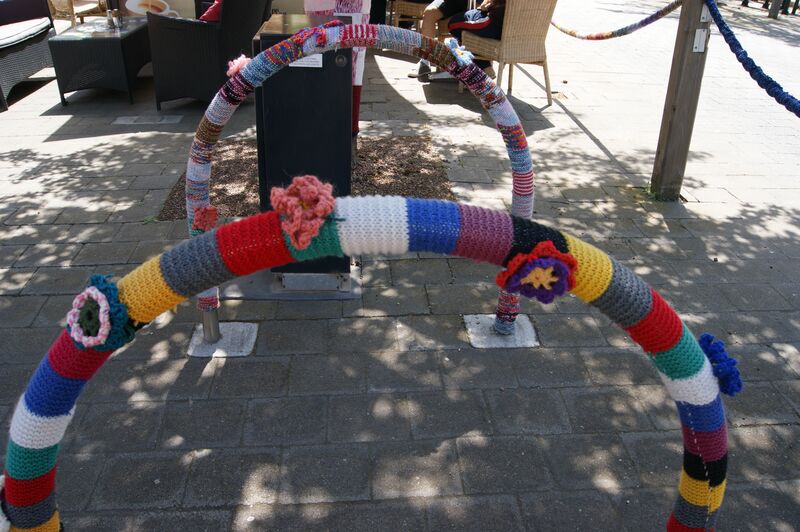 This entry was posted in Uncategorized and tagged crochet, photography, port adelaide, street art, yarn bomb, yarn bombing on October 15, 2012 by yarnbomb. 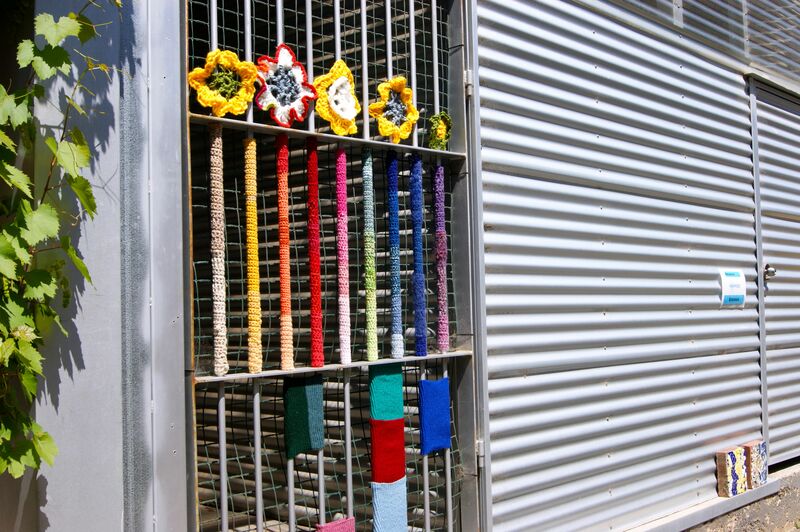 THIS FANTASTIC STREET ART IS MADE WITH CROCHET & KNIT BOMBING SEWN TO A CYCLONE FENCE. 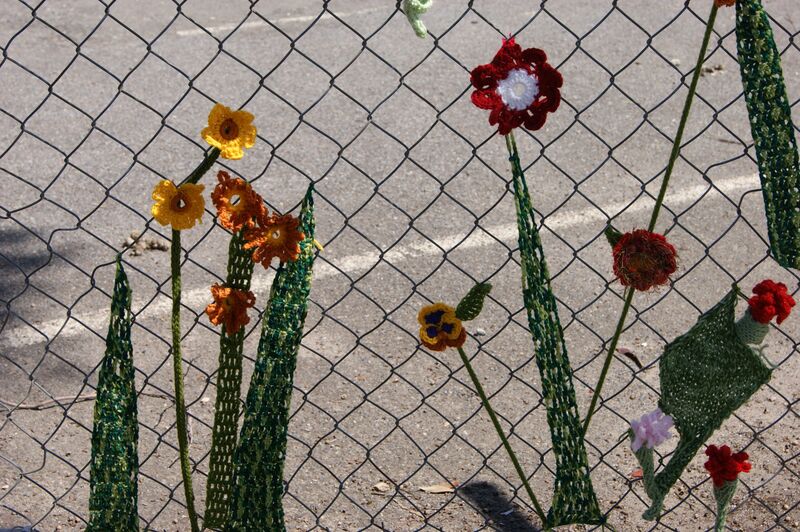 THE BRIGHT COLOURS & SOFT YARN USED FOR THE CROCHET FLOWERS HELP DULL THE BARBS OF THE WIRE ACROSS THE TOP OF THE FENCE. 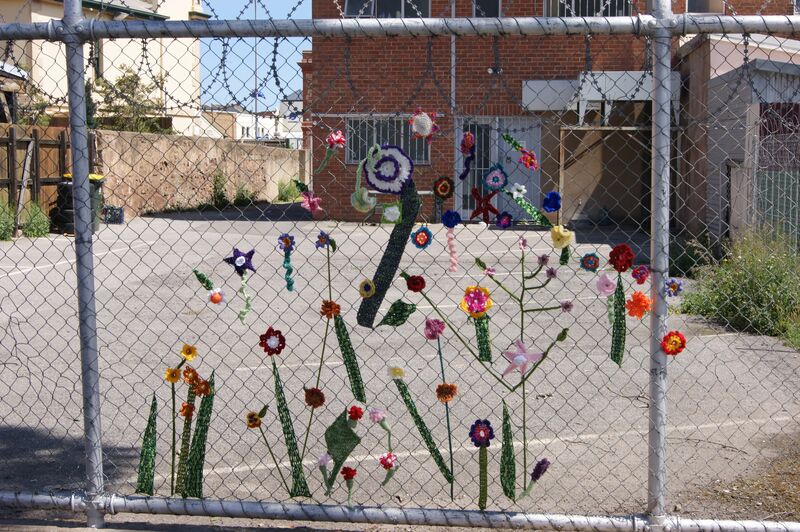 THIS FENCE IS SITUATED IN A SMALL SIDE STREET IN PORT ADELAIDE CALLED CALTON STREET. 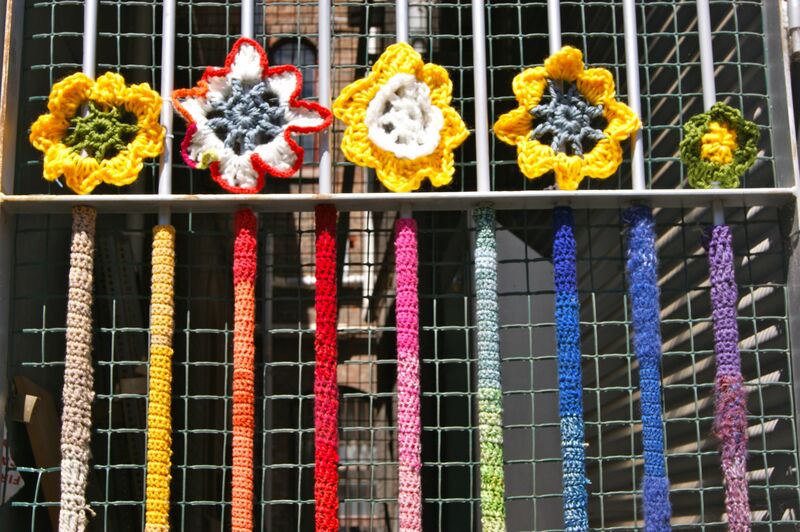 ACROSS THE STREET FROM THE CROCHET FLOWER FENCE IS A FENCE THAT HAS TWO PAIRS OF JEANS HANGING ON THE FENCE. 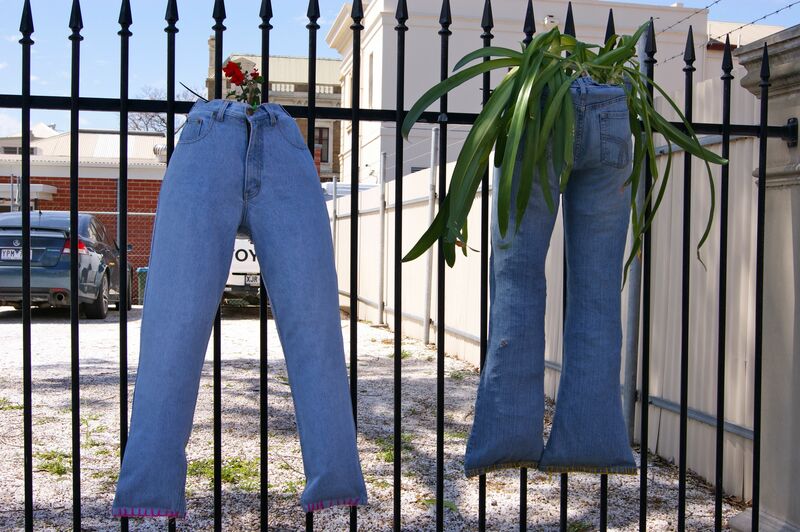 THESE JEANS HAVE BEEN HAND STITCHED ACROOS THE BOTTOMS THEN FILLED WITH SOIL TO MAKE RECYCLED PLANTER POTS. 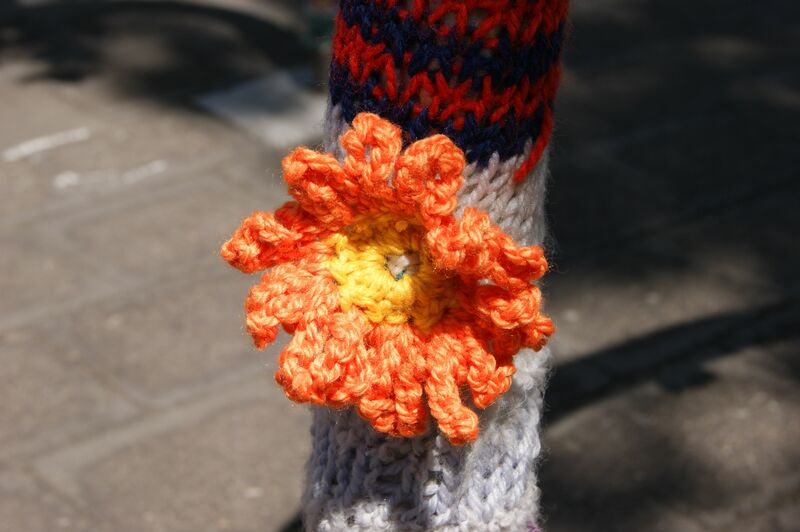 WHAT A GREAT WAY TO RENEW THE STREETS WITH SPRING FLOWERS. 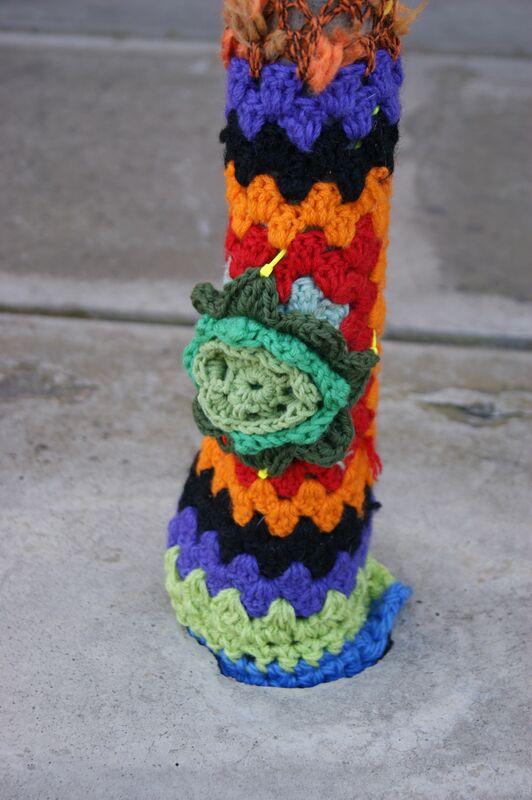 This entry was posted in Uncategorized and tagged crochet, jeans, knit bombing, photography, port adelaide, recycled planter, street art, yarn bombing on October 10, 2012 by yarnbomb. 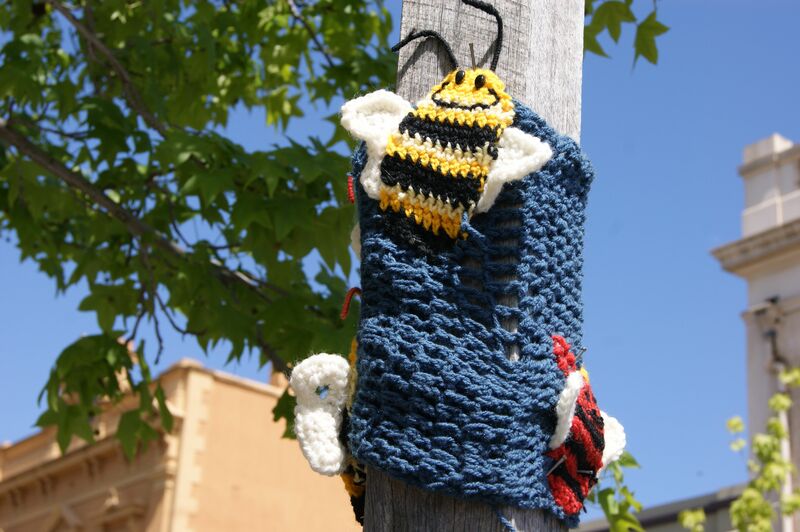 SPRING IS IN FULL SWING IN PORT ADELAIDE & ALONG WITH BLOSSOMS, GREEN LEAVES & FRESH FLOWERS THE PORT IS SPROUTING A FRESH CROP OF YARN BOMBS FEATURING FLOWERS & BUTTERFLIES. 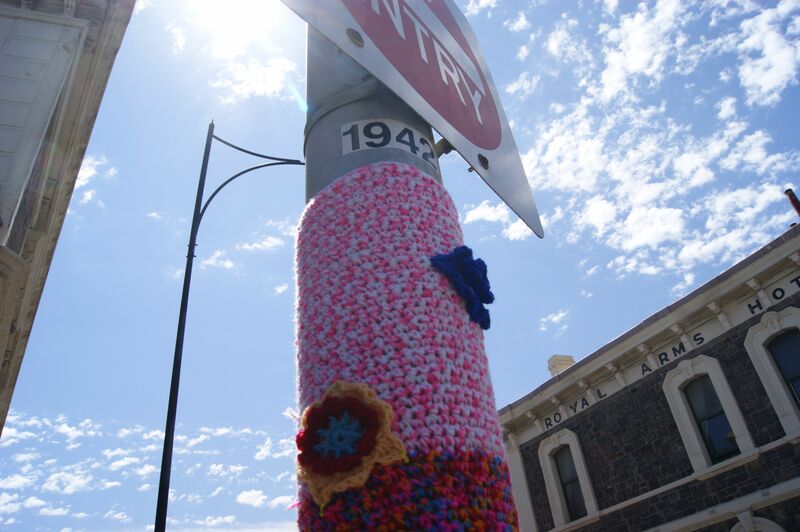 FROM CONCRETE SIDEWALKS TO BLUE SKY’S YARN BOMBING IS BRINGING SPRING TO PORT ADELAIDE. 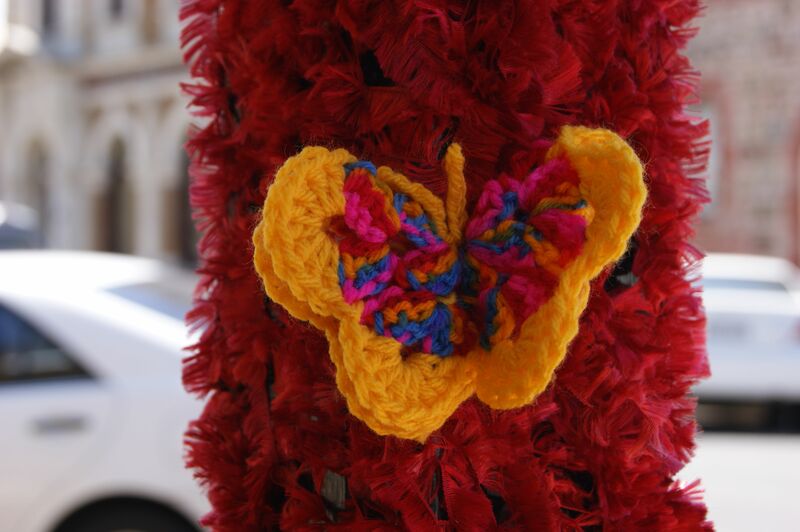 CROCHET BUTTERFLIES MAKE COLOURFUL STREET ART & BRING THE FEELING OF SPRING TO THE STREETS. 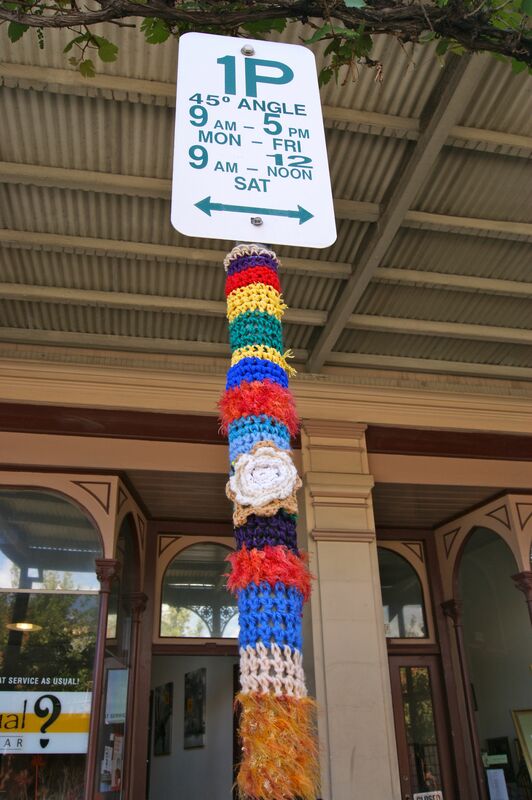 MY FRIEND BEL HAS BEEN WORKING ON THE CROCHET FOR THIS SIGN POST FOR SEVERAL MONTHS & I EVEN SAW HER KNITTING IN THE PUB. 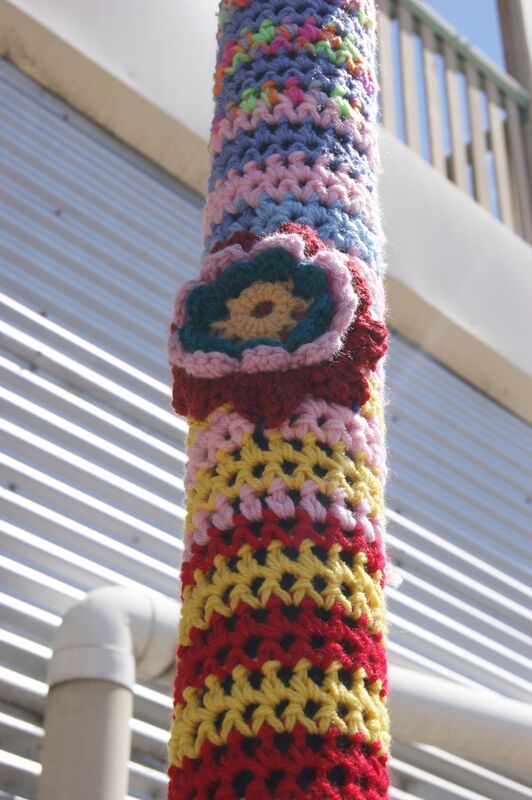 MY FRIEND SARAH JANE YARN BOMBED THIS POLE ON THE SIDE STREET BY HER ART SCHOOL ACTIVE ART STUDIOS IN PORT ADELAIDE. STAY TUNED FOR MORE UPDATES ON SPRING YARN BOMBING IN ADELAIDE SOUTH AUSTRALIA. 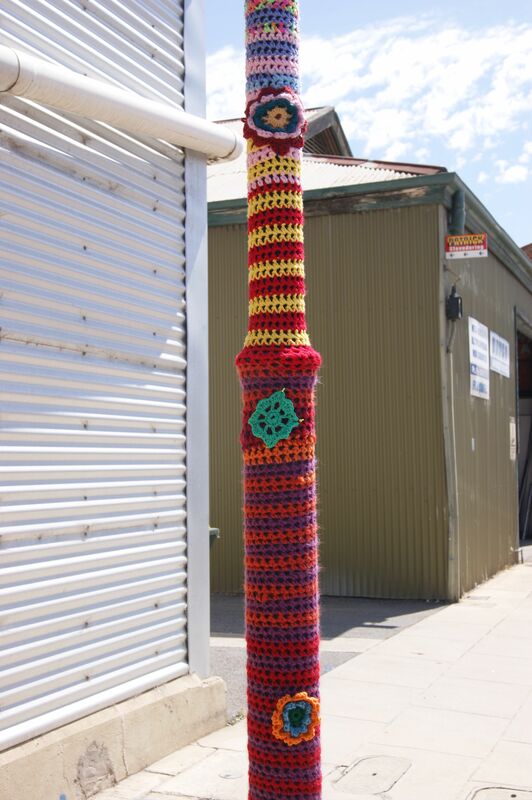 This entry was posted in Uncategorized and tagged crochet, photography, port adelaide, street art, yarn bomb, yarn bomb pole, yarn bombing on October 8, 2012 by yarnbomb.